HAYS, Kan. – The first group of students in the Doctor of Nursing Practice program at Fort Hays State University, in its first full year of operation, will soon graduate. The program is designed to train doctoral-level nurse practitioners who will put academic nursing research to use in treating patients. The first group of Doctor of Nursing Practice students will graduate this May. The bachelor’s to doctorate program has already admitted students to begin in the fall. 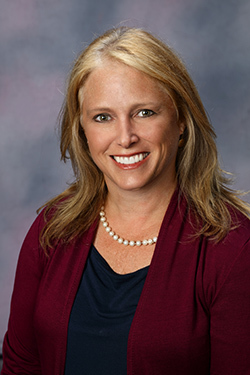 The foundational purpose of the Doctor of Nursing Practice program is to produce nurse practitioners who will be change-leaders in the hospitals and communities where they work to improve patient outcomes and the patient experience, said Dr. Colleen Paramesh, assistant professor or nursing at Fort Hays State. The culmination of the DNP program is the project. Each student designs and conducts a project that must be sustainable, in Paramesh’s terms, so that the work in the project can be maintained and continue to improve care. The doctoral projects of two of the first six students, Callea Breiner, a nurse practitioner focusing on ostomy care in Manhattan, and Abbie Weatherley, an emergency room nurse practitioner in Kansas City, will present their work at the Midwest Nursing Research Society later this spring. Breiner’s project, “Quality of Life and Self Efficacy in Ostomy Patients in a Local Support Group,” seeks to improve the quality of life for ostomy patients. Weatherley’s project, “Sepsis: Utilization of a Protocol and Algorithm in the Emergency Department,” is aimed at improving care and treatment for patients coming into the emergency room with severe infections. Results from their work will be presented at the society’s conference in Cleveland, Ohio, in April. “The DNP expands on master’s-level education to improve the nurse practitioner’s knowledge and use of evidence-based practice and leadership to improve patient outcome,” said Dr. Colleen Paramesh, assistant professor of nursing at FHSU. Paramesh said that the key to doctoral nursing practice projects is that they must be sustainable, so the work performed in the project can be used in their communities and organizations. All six of the MSN to DNP projects currently under way, she said, are showing significant improvements in patient care, and they are making sustainable impacts in their facilities and communities. Breiner, for instance, a nurse practitioner for a gastrointestinal medical and surgical group in Manhattan, saw many ostomy patients who had no follow up care. “As I was seeing people more frequently and the need for support, the idea for the support group was there,” she said. In June of 2016 she started a support group that drew members from as much as 60 miles away. So when she began in the DNP program at Fort Hays State, she decided that her project would be to implement a project to improve care and evaluate the effectiveness of an educational program and a support group for ostomy patients, both in terms of being able to provide daily care for their own ostomies and to improve quality of life. The protocol is a way of implementing the pre-set guidelines established by the Centers for Medicare and Medicaid, she said, which hospitals must follow in order to qualify for reimbursement. The compliance percentage was not where the hospital wanted it to be. Paramesh emphasized the primary point. “The takeaway for the DNP program is that everything we do has to help patients,” she said, listing the general criteria for evaluation: The program is focused on enacting change; that change has to meet the requirements of health care today; the projects have to improve care for patients.